‘Exam Policies’ contains the policies governing the Physiotherapy¹ Competency Examination (PCE). The Canadian Alliance of Physiotherapy Regulators (CAPR) reserves the right to change these policies and procedures without prior notice. You can find a description of the application process, the required forms and other instructions for registering for the PCE at www.alliancept.org. For exam application, process, dates and fees, see PCE Exam Registration Guide. ¹ Physiotherapy, physiotherapist, physical therapy, physical therapist, physiothérapeute, physiothérapie, PT and pht are official marks used with permission. In this document, physical therapy means the same thing as physiotherapy, and physical therapist means the same thing as physiotherapist. CAPR, incorporated in 1992, is dedicated to developing and improving regulatory standards of practice for physiotherapists. Our member organizations regulate physiotherapy according to provincial and territorial legislation. The Physiotherapy Competency Examination (PCE) tests whether qualified exam candidates have demonstrated a minimum standard of practice. It fairly and accurately evaluates the competencies needed to practise physiotherapy. All physiotherapy regulators in Canada, except Quebec, require applicants to have passed the PCE before being granted the right to practice; although Quebec requires all applicants trained outside Quebec to have passed the PCE. Quebec-trained applicants must pass a comprehensive exam unique to that province that is equivalent to the PCE. The PCE, and its Quebec equivalent, tests the essential competencies of physiotherapy practice – the essential knowledge, skills and abilities. It tests history-taking, physical examination, data interpretation, clinical problem solving, treatment techniques, ethics, safety, interviewing and communication. The exam covers the core clinical practice areas: neuromusculoskeletal, neurological, cardiopulmonary-vascular and multisystem. The PCE has two components; the first is written, the second is clinical. Candidates must pass the Written Component (Qualifying Exam) to be eligible to attempt the Clinical Component (Physiotherapy National Exam). Written Component (Qualifying Exam). A multiple-choice exam that tests the candidate’s understanding of the principles and processes of physiotherapy practice. Clinical Component (Physiotherapy National Exam). An objective structured clinical exam (OSCE) that tests the candidate’s ability to safely and effectively apply the principles and processes of physiotherapy practice. Requirements for registration as a physiotherapist differ from province to province and territory to territory. Applicants are responsible for contacting the provincial or territorial physiotherapy regulator where they wish to become registered for details. For example, some regulators may require applicants to pass an examination testing their knowledge of the rules of physiotherapy practice in that jurisdiction, or the Physiotherapy Competency Examination (PCE). Some may require applicants to submit evidence of good character in jurisdictions where the applicant was previously registered. Federally, the two official languages of Canada are English and French. But not all provinces and territories are officially bilingual. All provincial and territorial regulators will require fluency in either English or French, but not both. Applicants who wish to practice in Quebec must be fluent in French, and must contact l’Ordre professionnel de la physiothérapie du Québec. Prospective Ontario applicants may “pre-register” with the College of Physiotherapists of Ontario before they qualify for practice in that province. Although pre-registration is optional, the Ontario College strongly recommends it. Those interested in practising in Northwest Territories or Nunavut must contact the territorial health department or their proposed employer. This policy applies to all Canadian-educated and internationally-educated physiotherapists attempting the Physiotherapy Competency Exam (PCE). This policy applies to both the Written Component (Qualifying Exam) and the Clinical Component (Physiotherapy National Exam) of the PCE. To provide clarity regarding who may attempt the PCE, when they are eligible to attempt the Written or Clinical Components of the PCE and the number of attempts a candidate is permitted for each component. Canadian-educated candidates must be enrolled in an entry-to-practice physiotherapy program that has been accredited by Physiotherapy Education Accreditation Canada (PEAC). Canadian-educated candidates may attempt the Written Component of the PCE in their final term of academic study. To attempt the Clinical Component of the PCE, Canadian-educated candidates must have completed their full course of study and must be eligible for graduation. Clinical exam results will not be released to the candidate until the Canadian Alliance of Physiotherapy Regulators (CAPR) has received an official transcript, directly from the university, proving that the candidate has successfully completed the physiotherapy program and is eligible for graduation. Before being permitted to attempt the Written Component of the PCE, internationally-educated candidates must have written confirmation of eligibility from the CAPR Credentialling Program indicating that the candidate has successfully met the CAPR Credentialling Standards, which require a physiotherapy education that is deemed not substantially different from that of a Canadian-educated candidate, as well as proof of language proficiency in English or French. 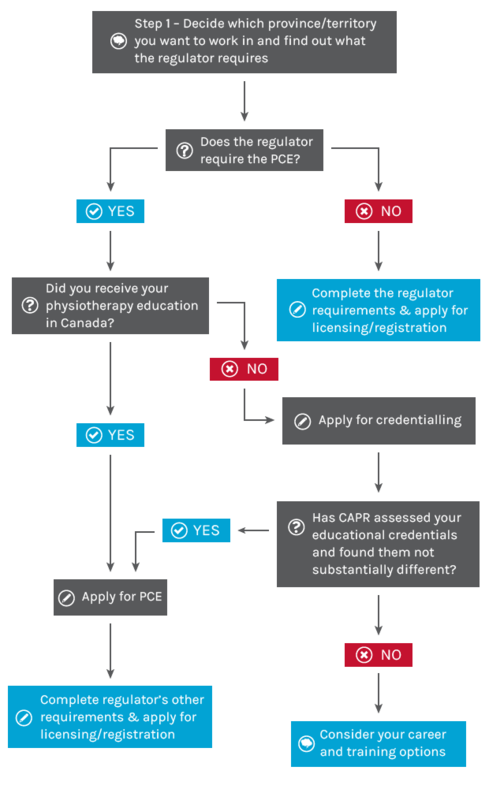 All candidates, both Canadian-educated or internationally-educated, must pass the Written Component to be eligible to attempt the Clinical Component of the PCE. All candidates, whether Canadian-educated or internationally-educated, have a maximum of 3 attempts to pass the Written Component of the PCE and a maximum of 3 attempts to pass the Clinical Component of the PCE. After 3 failed attempts at either component, a candidate has exhausted his or her exam eligibility. This applies to all new candidates and candidates who attempted the Written Component for the first time in 2013 or later. These candidates are referred to as Section A candidates. All candidates, whether Canadian-educated or internationally-educated, who prior to 2013 attempted the Written Component of the PCE for the first time (referred to as Section B candidates) have a maximum of 5 attempts to pass the Written Component and a maximum of 5 attempts to pass the Clinical Component, as was the policy in place at the time of their first attempt. After 5 failed attempts at either component, a candidate has exhausted his or her exam eligibility. As of January 1st, 2019 , CAPR will no longer require candidates to provide a Declaration of Identity Form (DIF) as a proof of identity when registering for the Physiotherapy Competency Exam (PCE). Each candidate is required to provide 1 colour passport sized/quality photograph taken within 6 months of the date of applying for their initial written exam should that candidate be educated in Canada (CEPT). On the back of the photograph, you must provide your name (printed), the date the photograph was taken, and your signature. For Internationally educated candidates (IEPT’s), please see the Credentialling policy guideline for more information on what is required from you. The lifespan of the candidate’s photograph will remain the same as the Declaration of Identity. Following 5 years (starting from the date of the candidates initial application), the candidate is responsible for ensuring that a new photograph is sent in prior to registering for their next exam. Applicants who change their appearance during the PCE process must submit a new photograph. The photographs submitted will be used to check identity when applicants arrive to take the PCE. Applicants whose appearance does not match the photograph and information prepared for the PCE may not be able to take the exam. Should other forms of information change such as your name, please complete and send in a change of information form along with all relevant supporting documentation. We score the two parts of the Physiotherapy Competency Examination independently. You must successfully complete the Written Component (Qualifying Exam) to advance to the Clinical Component (Physiotherapy National Exam). You must successfully complete the Clinical Component to receive a certificate of successful completion of the Physiotherapy Competency Examination. To pass the Written Component, you must achieve an overall score of 330 or higher on the standard score scale. We convert your number of correct answers to a standard score so that we can compare candidates’ scores from different sittings of the exam. Your standard score is not equal to the number of questions you answered correctly on the exam. The average score for all Canadian-educated candidates taking the exam for the first time is set at 500. The standard deviation of the scale is set at 100. These values allow you to see whether your score is above or below the average score. If your score is higher than 500, your exam performance was better than the average performance of the Canadian-educated candidates taking the exam for the first time. If your score is below 500, your performance was below that average. To give you more information on your performance, we also give your score for each area of practice and function (sub-scores). These sub-scores are expressed as percentage correct. We also provide the mean percentage correct for all the candidates who took that particular exam. We score the Clinical Component of the Physiotherapy Competency Examination on three criteria. You must meet all three criteria in order to pass the exam. Your station score for ten-minute stations represents how many checklist items you did correctly (80 percent of the station score) and how the examiners rated your performance and communication (20 percent of the station score). Your station score for five-minute stations represents how many checklist items you did correctly (40 percent of the station score) and how the examiners rated your performance (10 percent of the station score) in the clinical encounter, plus how you scored on the written portion of the station (50 percent of the station score). Your total score is the average of your station scores, converted to a standard score. To meet this criterion, you must achieve a minimum overall score. Meeting the total score criterion shows that you have demonstrated an overall minimum standard over a range of knowledge, skills and abilities. The total score does not provide information about specific areas of practice or functions where you may have gaps in your knowledge, skills or abilities. To meet this criterion, you must pass a minimum number of stations. Meeting the Number of Stations criterion shows that you have performed satisfactorily on a minimum number of sets of items. The number-of-stations criterion will identify frequent or systematic gaps in your knowledge, skills and abilities. The number-of-stations criterion prevents you from passing the Clinical Component if you do well in some stations but badly in others. By doing so, it ensures that you show consistent knowledge, skills and abilities from station to station. To meet this criterion, you can have no more than two minor safety or professionalism violations during the exam, and you cannot have any major safety or professionalism violations. Examiners write down any critical incidents, which are actions or behaviours that cause concern about your ability to practise physiotherapy safely and professionally. The Board of Examiners reviews these critical incidents and decides whether each identified incident is a safety or professional violation. They consider many factors, including the accuracy and completeness of the examiner’s documentation, the planned portrayal by the standardized client, relevant literature, past decisions on similar critical incidents, and the professional judgment of the Board members. For more information on scoring, see Frequently Asked Questions in the “Exam” section of our website, www.alliancept.org. Results for the Written Component will be sent by mail to the applicant’s address within 6 weeks of the examination. Results for the Clinical Component will be mailed within 12 weeks of the exam. Canadian-educated exam applicants must make sure that CAPR has received the final official transcript directly from their university program before clinical exam results can be released. Applicants are responsible for ensuring that CAPR has their current address and should not phone, fax or email CAPR asking for exam results. Exam results (Pass/Fail) will be posted on the website (www.alliancept.org) on the same day that they are mailed. CAPR will send each candidate an email with their PIN and a link to the results. Policy 8: Merged with Policy 4 in April 2018. Suite 501 – 1243 Islington Avenue, Toronto, Ontario M8X 1Y9. Re-scoring involves checking to make sure that a candidate received credit for all correct answers. Exam results rarely change following re-scoring. If re-scoring changes an exam result from a fail to a pass, the re-scoring fee will be refunded (for more information, see the FAQs). Administrative Reconsiderations are for incidents that affected your ability to perform your best in the exam due to circumstances that were beyond your control. These incidents must have occurred on exam day. If an incident occurred at any point before the exam you should consult the section on Illness or Other Extraordinary Circumstances before or on Examination Day, located in The Exam Registration Guide, Section 9: Refund Policy. Illness on the day of the exam. Administrative issues on the day of the exam. If the circumstances of your exam affected your exam performance in a negative way or placed you at a disadvantage compared to other candidates, you may be eligible for administrative reconsideration. These circumstances could include exam procedures that are significantly different from CAPR’s standard exam. Extraordinary circumstances. If extraordinary circumstances beyond your control, such as a family emergency, could have affected your exam result, you may be eligible for administrative reconsideration. If you are requesting administrative reconsideration because of illness, we must receive your written request within 7 days of the exam. You must submit a Candidate Medical Certificate. If you are requesting administrative reconsideration for any reason other than illness, we must receive your written request at our office within 30 days of the date on your results letter. Please deliver or mail the required documents (your letter plus any supporting documentation) and fees to our office to the attention of the Manager of Operations – Examinations. The administrative reconsideration, conducted by our staff, includes an administrative and statistical audit of test sheets and other documents, as well as interviews with examiners, standardized clients and site staff, as required. If your request for administrative reconsideration is based on illness, send medical documentation from a licensed or registered healthcare practitioner and a Candidate Medical Certificate (see alliancept.org ). annul the charge for the exam fee for your next exam attempt. We will not change a fail to a pass in an administrative reconsideration. For more information, see the FAQs on our website. If you are not satisfied with the outcome of your administrative reconsideration, you may choose to appeal. In an appeal, we review all the information related to your performance to determine whether the issues you raised could have significantly affected your result. We also determine whether you were treated fairly in the administrative reconsideration process. Suite 501, 1243 Islington Avenue, Toronto, Ontario M8X 1Y9. You must request an administrative reconsideration and receive the response to that request before you can request an appeal. You must request an appeal in writing. Include a confidential letter describing the issues on which you are basing your appeal. We must receive appeal requests at our office no more than 30 days after the date on your administrative reconsideration response. Please deliver or mail the required documents (your letter plus any supporting documentation) and fees to our office to the attention of the Chief Executive Officer (CEO). The CEO will assemble an appeal panel to consider all the information related to your performance, including your administrative reconsideration and any additional information you provide. If you appeal your administrative reconsideration, we will already have your relevant documents on file. You can submit more documents relevant to your appeal, such as further explanation or details of the issues, or more medical documentation. We will not consider letters of reference or information about your performance in undergraduate placements in your appeal. In limited circumstances, the appeal panel may decide to change a fail to a pass. The decision of the appeal panel is final. Before you register for the PCE, you must read and understand the limits of liability. You must tell interested parties, such as potential or current employers, about the limits of liability. While the Canadian Alliance of Physiotherapy Regulators (CAPR) takes reasonable steps to ensure the accuracy and completeness of information, resources and reports, neither CAPR nor any of its officers, employees or agents shall be responsible for damages or losses in the event of any errors or omissions, or liable for any damages or losses incurred by a candidate, an employer or a contractor as a result of any decision made by or on behalf of CAPR or any of its officers, employees or agents. This means that CAPR is not responsible for impacts of a personal, professional or financial nature. This includes such impacts as loss of income, loss of salary and expenses incurred by an employer, a contractor or a candidate. By registering for and participating in the PCE, you agree that you will take no legal action or other proceedings against CAPR or any of its officers, employees or agents for anything done in good faith related to the PCE, including any errors, omissions, neglect or default. You also agree to fully release and indemnify CAPR, its officers, employees and agents for any such actions or proceedings. This means that CAPR will not be responsible for any loss of income or other expenses incurred by you or an employer or contractor due to a decision made by CAPR related to the PCE, and that you agree not to take legal action against CAPR. We do not offer financial assistance or information on possible sources of financial assistance. We cannot dismiss or change exam fees except as noted elsewhere in the policies. CAPR is a non-profit organization. The money we need to administer the Physiotherapy Competency Examination comes from the exam fees we collect. We conduct research using non-identifying exam data, and we may also provide this data to external researchers. Non-identifying exam data is data from your exam, such as your answers and marks that does not include your name or identification number and cannot be traced back to you. By signing the application form, you are consenting to the use of non-identifying data for research purposes. CAPR maintains strict security over exam content before, during and after the exam to eliminate unfair advantages among candidates and to avoid the costs of replacing exam questions if cheating occurs. All exam materials are protected by copyright. Our security measures protect exam material while it is being developed and reviewed; while it is being reproduced, transported and disposed of; and while it is being presented on the exam day. We strictly enforce the rules of conduct for the Physiotherapy Competency Examination and exam security, as described in section 12. Candidates who do not follow the rules of conduct may be asked to leave the exam site, may not receive results of the exam, or may have their results cancelled. Please note that we may use monitoring and surveillance technologies to detect and document cheating. The Physiotherapy Competency Examination and its contents are the exclusive property of the Canadian Alliance of Physiotherapy Regulators (CAPR). You cannot remove any part of the Physiotherapy Competency Examination from the exam site, or memorize/ record questions for distribution. Your behaviour before, during and after the exam cannot disturb other candidates or cause them anxiety. Do not make disruptive comments about the exam, unnecessarily question exam policies and procedures or engage in other behaviour that could disturb other candidates. If you cheat, as defined below, we may ask you to leave the exam site, we may decide not to mark your exam or we may take other appropriate action. Non-registered individuals posing as registered candidates. Bringing study materials to the exam room(s), or any other material that has not been expressly permit- ted, including electronic devices. Giving or receiving help during the exam. Engaging in any conduct during the exam that disturbs or is disrespectful towards other candidates or exam staff. Removing or trying to remove exam materials from the exam site. Receiving or distributing information about the Written Component or the Clinical Component either before or after the exam². You cannot share information about the diagnoses, tasks or activities that are included in the exam. Do not discuss information about Clinical Component stations with other candidates or examiners, even after the exam. Commencing the exam before being instructed to do so and/or continuing the exam after being told to cease. Disregarding instructions from the exam supervisor, invigilator or any exam staff. Modifying exam results letters or other Alliance documentation to give a false impression of having passed the exam, or misrepresenting your exam status. Any activity that would be considered illegal, such as assault, harassment, or theft. If the exam personnel suspect that you are cheating, they may take your exam materials, as well as any other documents, objects or materials that could be used for cheating, and make you or others leave the exam site. The exam personnel report any suspected cheating to the Manager of Operations – Examinations of CAPR. The Manager of Operations – Examinations conducts appropriate investigations into all suspected cheating. You will have an opportunity to submit a written response to the suspicion of cheating. Declare that we cannot confirm whether you cheated. Declare that you may have cheated, and recommend appropriate sanctions. Declare that you did cheat, and approve the sanctions. If the Exam Steering Group or the Evaluation Services Committee declares that we cannot prove cheating occurred, we will release your score, if possible, or we will let you take the next available exam without charge. CAPR reserves the right to begin an investigation into suspected cheating at any time before, during or after the Physiotherapy Competency Examination is administered. We will report our findings to the physiotherapy regulators. We may permanently ban you from testing. This means you would not be eligible to write the exam again. The Canadian Alliance of Physiotherapy Regulators (CAPR) is committed to providing accessible and equitable service to all exam candidates, including administering the Physiotherapy Competency Examination (PCE) in a way that respects the dignity and independence of persons with disabilities. CAPR will make the PCE accessible to per- sons with disabilities to the extent possible, including making arrangements for special accommodations available to candidates who have provided evidence of special needs. In reviewing accommodation requests, CAPR must balance the rights of the individual examination candidate with its mandate to protect the public interest through a fair, secure, valid and reliable licensing exam. The protection of an individual’s rights to demonstrate competency in physiotherapy practice within the context of the Physiotherapy Competency Examination (PCE). The protection of personal, private information, including personal health information. CAPR will only release personal and/or personal health information for the purposes of determining the most appropriate accommodation. In doing so, CAPR will provide the client seeking an accommodation with access to his or her own records, and be completely transparent regarding how the health information is used. CAPR notes that it does not differentiate between permanent and temporary disabilities when considering re- quests for accommodation. CAPR will review requests for accommodation on a case-by-case basis to ensure that candidates seeking accommodation receive a fair and equal chance to demonstrate the required knowledge, skills and abilities for entry to practice, without compromising the exam’s reliability, validity or security. All requests are confidential and shall only be discussed between CAPR, the candidate seeking accommodation and, if necessary, a third-party consultant (see below for details). Any individuals involved (e.g. a reader or recorder) in providing or supporting an approved accommodation must sign an agreement with CAPR stating that they will not provide any assistance to the candidate other than that agreed to by CAPR in the context of the accommodation, or attempt to copy or recall any exam materials. Doing so will be considered a breach of CAPR’s Rules of Conduct for the Physiotherapy Competency Examination and Exam Security. Requests for accommodations of a physical, cognitive or other special need ought to be made at the same time as applying for the exam, but no later than 30 business days before the written exam date and 65 business days before the clinical exam date by completing the Special Needs Accommodation form available on CAPR website. CAPR must receive documentation with the completed application that clearly demonstrates that the accommodation is necessary. The documentation provided must be consistent with the ‘General Principles’ and ‘Examples” outlined on the CAPR website. Providing CAPR with fraudulent documents for the purpose of obtaining an unneeded accommodation is considered “cheating” and a violation of CAPR’s Rules of Conduct for the Physiotherapy Competency Examination and Exam Security. Notwithstanding the usual requirements for submission of requests for special needs accommodations, for situations of recent injury and illness which occur immediately prior to exam date, candidates may request accommodations on a shorter timeline. These requests are an exception to normal business procedures and must be made as soon as possible prior to exam date. CAPR will officially respond to all requests for accommodation in writing, and is responsible for the cost of providing accommodations to the point of undue hardship. By requesting accommodation for special needs, the candidate agrees that CAPR may disclose his/her name and the accommodation provided to physiotherapy regulators. The offer of accommodations for the exam does not obligate CAPR to offer the same, or other, accommodations for any future administration of the exam. CAPR reserves the right to deny accommodations if sufficient evidence has not been provided to support the accommodation request, or if CAPR determines that the accommodation is unreasonable or practically not possible (e.g. would compromise the validity of the exam or its security, or would result in unfair advantage). Candidates previously awarded accommodations by their university-level physiotherapy education program may provide a copy of those accommodations, as well as authorization for CAPR to contact their program. CAPR will consider accommodations that have been awarded by an educational program, but is not bound to provide the same accommodations in the PCE. The final decision regarding an accommodation request is primarily the responsibility of CAPR National Director of Evaluation Services, in collaboration with the Manager of Operations – Examinations, but may include the Evaluation Services Committee or the Board of Directors, depending on the nature of the accommodation. CAPR’s decision will be communicated in writing to the candidate, and the candidate must indicate their satisfaction with the accommodation by signing and returning the final accommodation plan with original signature to CAPR prior to the examination date. CAPR may request third-party input from a psycho-educational consultant, which may also include a review of psycho-educational supporting documentation provided by the candidate. If CAPR determines that such a consultation is required to develop the accommodation plan, CAPR will request specific consent from the exam candidate to share the supporting documentation to enable this review. Any reports produced by the consultant will be considered the property of CAPR. Available on CAPR website, www.alliancept.org. The orientation videos help candidates be better prepared for the exam-day process and is designed to help exam candidates develop a better understanding of the Physiotherapy Competency Exam (PCE), and in particular the Part Two Clinical Exam (OSCE) process. Has a wealth of answers to frequently asked questions related to the PCE. This document aims to raise awareness of the common errors candidates often make during the PCE Clinical exam (OSCE). This document highlights some of the most important things to remember about the PCE Clinical Exam (OSCE). This interactive tool allows candidates to try and see how many tips they have been able to remember. This is a list of references and resources that CAPR uses to prepare exam questions and stations. You may want to study some of these references. We strongly recommend that you complete the CAPR credentialling process prior to applying to any of the below Bridging Programs. For AIEPB Program please review information posted at https://www.ualberta.ca/physical-therapy/post-baccalaureate-certificate-in-bridging-to-canadian-physical-therapy-practice Questions about Admission or the Bridging Program should be directed to iept@ualberta.ca or (780) 492-8598. For OIEPB Program please review information posted at physicaltherapy.utoronto.ca/iept. Questions about Admission or the Bridging Program should be directed to (416) 946-8560. For questions related to the IEPEP Program, please review information at http://www.iepbc.ca/. Or contact the Program Administrator at: admin@ubc.ca, Tel: (604) 827-5934. For Professional Qualification Program in physiotherapy (QPP) please go to http://bit.ly/HXepsg or contact dube.2@umontreal.ca or (514) 343-6111 ext. 33244. We encourage you to review these resources well in advance of taking any components of the PCE exam. Our contact information is on page 3 of the Exam Policies. The exam department will answer any questions you have about the exam, policies and applications. Whenever you phone, write or email to us, please tell us your personal identification number (PIN). If you want to authorize someone else to represent you and to act or receive information on your behalf, you need to sign a power of attorney document. After you send us an original notarized5 power of attorney, we will give information, correspondence and results to you or to your representative. We will not give information to your representative over the telephone. For more information and answers to frequently asked questions, please see our website, www.alliancept.org. 5 Notarized means that the document has been certified by a person who is authorized to administer oaths and certify documents. In Canada, this person is called a notary public. The Written Component is a four-hour computer-based exam with 200 multiple-choice questions that assess your knowledge of all functions and practice areas. Approximately 90 percent of the questions on the Written Component are associated with a vignette (a case scenario). The remaining 10 percent of the questions are stand-alone items. Chapter 3 of the Essential Exam-Taker Guide for the Candidates has sample questions. The questions are multiple-choice, with four possible answers. You must choose the one best answer for each question. The Clinical Component is approximately three and a half hours of exam time, with extra time for registration, orientation and breaks, for a total time of approximately five to six hours. We will assign you to either a morning session or an afternoon session. In the Clinical Component, you move through a series of 16 clinical stations. In each station, a brief written statement will introduce a clinical problem and ask you to obtain a focused history, conduct a focused physical examination, develop a treatment plan or perform an intervention and, in some cases, answer some written or oral questions. On an exam of 16 stations, 8 will be neuromusculoskeletal stations, 3 to 4 will be neurological, 2 to 3 will be cardiopulmonary-vascular, and 2 to 3 will be multisystem. The guidelines we use to administer the Clinical Component and train the examiners and standardized clients are the same for all sites. Examiners use predetermined station content checklists to assess your performance. These measures ensure that the Clinical Component is objective. Examiners give scores based on your performance at each station. The overall score for the exam is the sum of station scores. During clinical encounters and at written stations, you may be asked to perform, demonstrate or list a specific number of responses. We assume that you will choose the best of the options available to you. In many stations, the best answer will be worth extra marks. You must bring a lab coat and a stethoscope. We will provide any other equipment that you need in the stations. We will provide refreshments during the exam. We will not allow any other equipment or food in the exam area. We will provide hand sanitizer so you can clean your hands at the beginning of each station. You should take all other infection control precautions as indicated by the clinical situation. You will receive detailed information on exam-day procedures with your registration package. There are two types of clinical stations: couplet stations and ten-minute stations. Written instructions are posted outside each exam room and inside each station. An examiner will watch you and assess your performance using a predetermined checklist. A signal system is used to time the stations. You must wait for the signal before moving from one station to the next. The signal sounds to start the station, again when 30 seconds remain, and again at the end of five minutes, when you must leave the room. You have one minute to move from one station to the next. Ten-minute stations assess your ability to obtain a history, conduct a physical examination, demonstrate inter- viewing and communication skills, apply treatment skills or perform interventions. An examiner will watch you and assess your performance using a predetermined checklist. A signal system is used to time the stations. You must wait for the signal before moving from one station to the next. A signal sounds to start the station, again when two minutes remain, and again at the end of ten minutes, when you must leave the room. You have two minutes to move from one station to the next. In most ten-minute stations, you will interact with a standardized client for ten minutes. In a few stations, you will interact with the client for eight minutes, and then for two minutes the examiner will ask you brief questions related to the case. The examiner will listen to your answers and evaluate them using a predetermined checklist. Instructions posted outside the stations will let you know which stations have examiner questions. Please keep these exam policies until you receive your exam results.